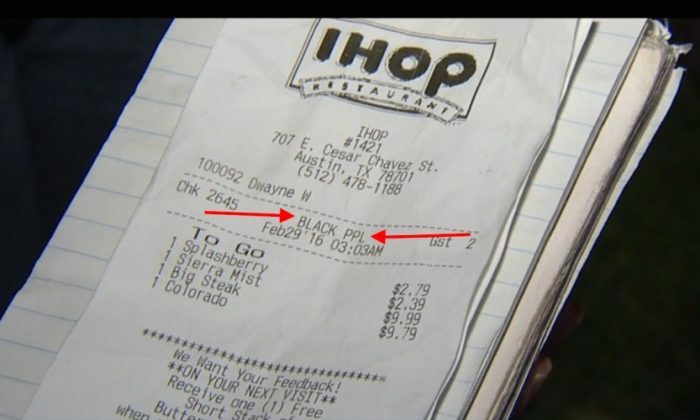 An IHOP in Austin, Texas, is under fire after a server wrote “BLACK PPL” on customers’ receipt for a takeout order, according to reports. The customers, Arainia Brown and boyfriend Rolman Sparkman, said they went to pick up a to-go breakfast order at an IHOP at I-35 and Cesar Chavez around 3 a.m. on Monday, reported KVUE-TV. I feel upset, I’m sad, I’m angry. Like this, it makes no sense. Brown said she immediately became upset. “I feel upset, I’m sad, I’m angry. Like this, it makes no sense,” said Brown. Brown said the server was a young black man, identified as Dwayne Williams. KTBC reported that Williams apologized on Facebook, saying he made a mistake in a rush to get their orders out on a busy morning. He also reached out to KTBC. IHOP issued a statement on the matter, per KVUE.